For an hour in the morning and another in the evening, I have the distinct honor of riding the BART to work. I wisely spend that time answering work emails, reading food blogs, and scrolling through Instagram. Oh, and I people watch because golly, the most "interesting" things happen on BART. Like the time a Paris Hilton look-alike demanded a separate seat for her tiny chihuahua on the crushingly crowded morning commute where people have lost limbs trying to score the last seat. Oh, or the time some guy thought he was Kanye West's double and insisted on rapping the whole way. Leather pants and all. But aside from the BART characters, the overwhelmingly majority of people have a glazed expression on their faces as they stare at their phones or in the distance. More often than not, the air is rife with a general apathy (and the smell of old laundry). Occasionally, someone will get on with a laughing baby and no one will look up. Or an elderly person will get on and no one will bother to offer a seat. It's truly apathy at its finest and that nothingness is so much worse than actual anger or malice because being malicious requires some effort. Some thought. But to do nothing is an indication that you just don't care and that is truly concerning. Except last week. Last week something amazing happened. A man was standing next to his bike. He was about average height with an average build, medium brown hair, and had a nondescript backpack. There was nothing particularly distinctive about him meaning he didn't have a chihuahua and wasn't (poorly) rapping up a storm. One minute, this man was standing there staring off into the distance surrounded by people doing the same. And the next minute, this man fainted, falling to the ground, his eyes closed, with his mouth hanging open. And people sprung into action. Someone quickly got up from a seat. Two other gentleman lifted this man into the seat. An grandmother sort of woman took his pulse. And suddenly, the man woke up. In all honesty, he looked a bit puzzled to see all these people hovering over him. And someone said, "Sir, you fainted." And someone else commented, "You look really pale." And the man chuckled good-naturedly and said, "That's what I get for being an Australian in the Bay Area" because well, he was the only "pale" man in a sea of well, not pale folk. In all honesty, I expected people to go back to scrolling on their phones and staring out the window. The crisis had clearly been averted. But no, the amazingness continued. Someone offered the man a bottle of water. Someone else offered him an orange. The grandmother sort of woman left her hand on his shoulder. I wished I had a homemade cookie to offer the man because I'm convinced cookies fix everything. But alas, it was not a cookie day. Instead, I sheepishly offered him a Jolly Rancher. A Jolly Rancher that had been in my bag far too long. He grinned as I fumbled around in my bag, pulling out a solitary sock, a ziploc of Legos, and finally, the elusive Jolly Rancher. We reached downtown San Francisco and the man joined the throngs of people filing out of the train. Within seconds, I lost him in a sea of nondescript backpacks. I like to think he went to work, grabbed a coffee, and thought, "Well, that was an odd morning." Or maybe he logged on to Dr. Google and researched blood sugar levels. Or maybe, just maybe, he ate that old Jolly Rancher and thought, "Yikes, this tastes like old backpack." Still thinking about the man, I baked Thomas Keller's famous chocolate chip cookies last weekend. 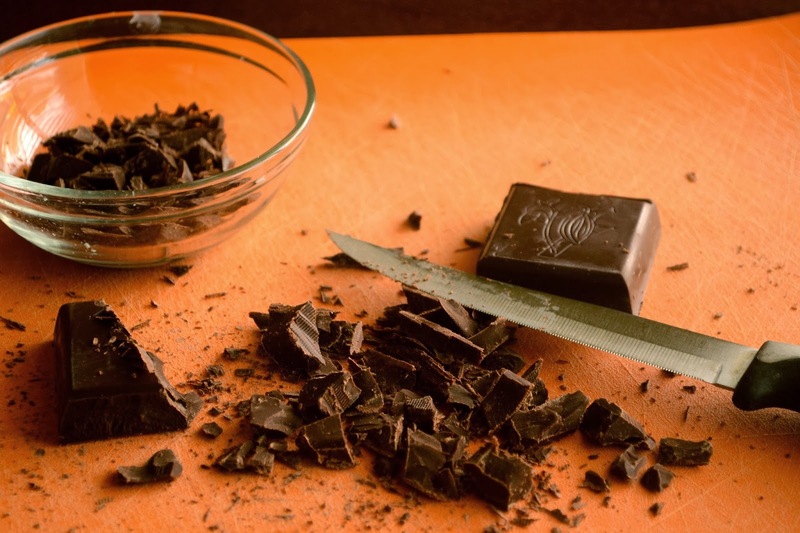 The ones that use the "good" chocolate and in all honesty, have more chocolate than flour. The ones that come together surprisingly quickly and don't require room temperature butter (the nemesis of all last-minute cookie cravings). The ones that are crunchy on the edges and perfectly soft in the center and bake up with those perfectly elusive cookie crevices. And I took a cookie (okay, two) to work every day not because I hoped a man would faint on BART and I would have the chance to rescue him with my cookies, but rather, because you never know who could use a cookie. And to the good man on BART, "I don't know where you are, sir, but I hope you're okay. Oh, and you restored my faith in humanity. At least for one morning." Position the oven racks in the lower and upper thirds of the oven and preheat the oven to 350°F. 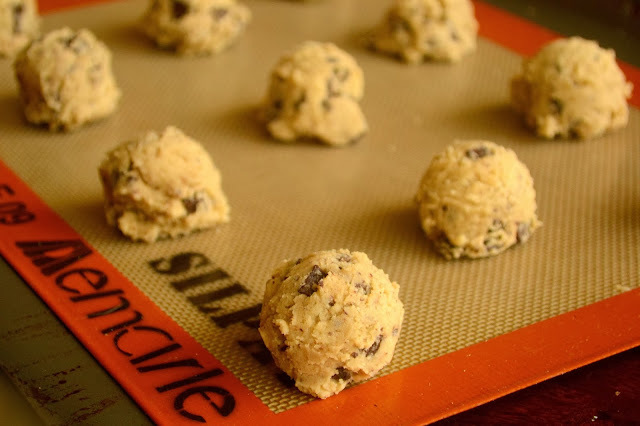 Line two baking sheets with Silpats or parchment paper. Put the chips in a fine-mesh basket strainer and shake to remove any chocolate "dust" (small fragments). In the bowl of a stand mixer fitted with the paddle, beat, half the butter on medium speed until fairly smooth. Add both sugars and the remaining butter, and beat until well combined, then beat for a few minutes, until the mixture is light and creamy. Scrape down the sides of the bowl. Add the eggs one at a time, beating until the first one is incorporated before adding the next and scraping the bowl as necessary. Add vanilla. Add the dry ingredients and mix on low speed to combine. Mix in the chocolate. Note the original recipe has about 10 ounces of chocolate. It makes a super chocolatey cookie (and that's coming from someone who loves chocolate). I cut down the chocolate a bit but definitely feel free to add more chocolate. Remove the bowl from the mixer and fold the dough with a spatula to be sure that the chocolate is evenly incorporated. Using about two level tablespoons per cookie, shape dough into balls. 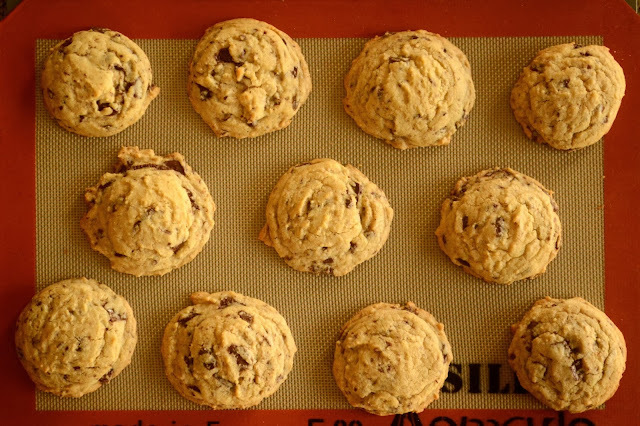 Arrange eight cookies on each pan, leaving about two inches between them, because the dough will spread. Thomas Keller has a suggestion to "mist" the tops of the cookies with water for a more chewy cookie. I wasn't exactly sure what "mist" meant but I did want a chewier cookie so I just dipped my finger in water and lightly patted a few of the cookies with water. Bake for twelve minutes, or until the tops are no longer shiny, switching the position and rotating pans halfway through baking. Cool cookies on the pans on cooling racks for about two minutes to firm them up a bit, then transfer to the racks to cool completely. Repeat with second batch of cookies. 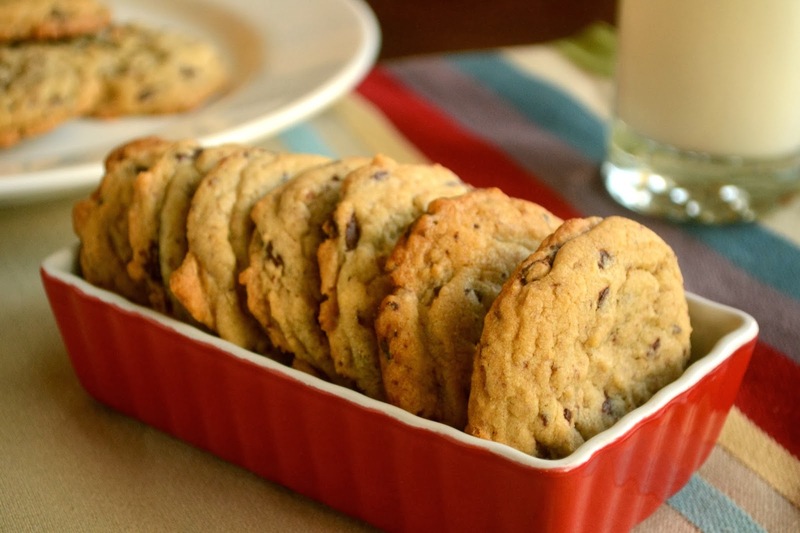 The cookies can be stored in an airtight container for up to two days. This was a great post. It restores my faith too, when people avert from their apathy long enough to show that really do still care. I have had a hunkering to make chocolate chip cookies and I think the Thomas Keller version just may be the recipe. Thanks for sharing. The cookies look great! I have no self control around a good chocolate chip cookie. I am sure I could eat the whole batch of these. Ah - as usual Azmina I immensely enjoy reading your writing. And this kind of hit the cord, as something similar about humanity has been on my mind. And yes, cookies that don't require room temp butter? YES please. If I was on Bart and I knew you had the cookies I may drop to the floor on purpose. That was so sweet and it reaffirms that there still are good folks out there. I have been craving some warm cookies, but am knee deep in Halloween horrors, lol. I haven't tried that recipe yet, will have to soon. Let this be our little secret, but I never have room temperature butter ready and I just throw the sticks in the microwave for 15-20 seconds and get on with it. I had to click your link to know what Bart was :-) Loved reading this post, it made me smile simply because there are ppl still cares about a total stranger. COokies looks so good. I always have sweets in my hand bag, one i love to eat them, the second reason when my daughter was younger and when ever we travlled she used to get these fainting because of low sugar . It is ages ago i made cookies mayb i should give this a try. So glad to hear that people came to this man's aid, and that you had a Jolly Rancher to offer! Truly makes me feel better after reading cnn.com this morning. I imagine that chihuahua was providing some sort of service? Yea right! But the cookies look delicious. A recipe to try for sure! Oh wow, hope the man's doing good, strange. Some people can be so so sweet. Your ride sounds like a really interesting one. I have another friend who travels in the Bart and she says it's one of the most calm places for her, she just dozes off in her own peaceful world. Now, these cookies look too good, I am in the Bay, I could drop by anytime..;).. Thank you, Azima for confirming there exists good people in this world who do good things when we least expect them to. I just received the "Bouchon Bakery" cookbook as a gift and I've been eyeing this cookie recipe for quite some time now. They look delicious! Hope you are doing well! little things like these really restore faith in humanity - love subways and interesting incidences there. This was a great post! I ride the DC-area metro to work everyday and experience the same behaviors. It is wonderful to know that people still come together in a time of need. Also these cookies look awesome! Great post. The cookies are scrumptious. Eid Mubarak. City life has made me just the same... seeing observing but never reacting, it's just part of a zombie life we live. These cookies are a great way to get jolted back into reality though!